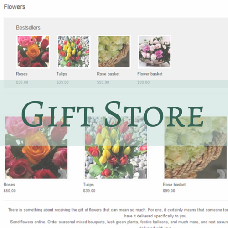 Gift store add-on will let you sell your own branded merchandise on your dating site or display goods and offers by third-party providers such as flower shops, jewellers, and so on. Site members can purchase store items for themselves or pick another site member who they wish to send gift(s) to. The recipient is asked whether s/he wants to receive a gift at all. If they do, they are prompted to indicate their address where they would like the gift to be sent. The address is only visible to the site administrator who will manage the delivery. It is not visible to the person who makes the gift – the sender. So the privacy is safe here. It is only after the confirmation from the part of the recipient that the sender can pay for the gift and for the delivery.